Are your feet ready for the Ski Season? Your whole body cops a massive workout when skiing, but your feet and ankles are extremely important if you’re going to “Char the Pow”. It’s imperative that you keep them happy and healthy to enjoy what the mountains just to our South have to offer. Blisters are commonplace when frictional forces are increased on the foot, you know what happens when you put on a pair of ill-fitting shoes, you get blisters. Anywhere your poor fitting ski boot rubs can cause blisters, the same can be said for socks and clothing too. Keeping your feet warm and dry (as we’ve discussed in a previous blog) is very important and this will help prevent blistering, your socks should wick moisture away, and a good pair of wool socks will achieve this, or some bamboo socks too. 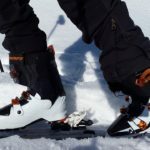 Your ski boots are as important to maintain your foot health as tyres are for a race car driver, poor fitting boots can not only cause blisters, but they can also lead to injuries after a busy day on the slopes. Diabetic associated foot conditions and Raynaud’s (a circulatory condition) are made worse by poor fitting ski boots. A rigid heel counter will prevent the foot from moving into a greater angle of medial (rolling in) and lateral (rolling out) rotation, reducing the risk of sprains, soft tissue damage (muscle, ligament, tendons and connective tissue) and bone trauma. So, take the time to get your boots professionally fitted, you’ll thank us later. A Podiatry Pitstop before the slopes? Of course if you are suffering any minor injuries and you do have your ski holiday booked, it’s best to take the correct steps 1st (pardon the pun) book an appointment at Canberra Podiatry now before you head to Thredbo or Perisher, we’ve been looking after Canberra’s Foot Health since 1997 and we’ve seen it all, the ski season is something we look forward to ourselves, and with Sports Podiatry being something we continually stay abreast of, we can make sure your trip to the mountains is pain free. If you’d like a winter check-up to make sure you’re good to go, call Canberra Podiatry today on 6281 1200 for an appointment, we’ll make sure you put your best foot forward this Winter.